Mojo (Spanish pronunciation: [ˈmoxo], from Portuguese molho [ˈmoʎu], meaning "sauce") is the name, or abbreviated name, of several types of sauces, varying in spiciness, consisting primarily of olive oil, local pepper varieties (called pimienta in the Canary Islands), garlic, paprika (called pimentón in Spain), cumin or coriander, and other spices. Mojo originated in the Canary Islands, where the main varieties are red mojo (mojo rojo) and green mojo (mojo verde). Other countries have recipes similar to mojo, where acid ingredients such as vinegar, lemon, orange, or lime juice may be used. Green mojo, or mojo containing green spices, is commonly used for fish, especially the proper green mojo (made with green pepper) but also coriander mojo (mojo de cilantro) and parsley mojo (mojo de perejil). As coriander mojo and parsley mojo contain some water, they need to be kept in the fridge and have to be consumed within the two days after preparation. Red mojo, made of small red peppers from La Palma (called pimienta picona) and paprika, is usually eaten with meat. Red and green mojo can be used interchangeably to season some dishes, prominently papas arrugadas con salsa mojo, or potatoes with mojo. Mojo is also commonly served with fresh bread rolls at the beginning of a meal. 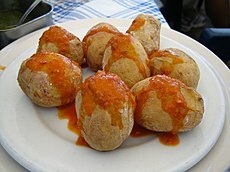 Local variations of mojo include recipes with cheese such as mojo con queso (mojo with cheese) from La Palma and El Hierro, as well as almogrote from La Gomera, where it is turned it into a paste that can be spread over bread. Every Canarian family has its own recipe for mojo, so it can vary greatly in flavour, spiciness and texture. There is also almond mojo which is an ideal accompaniment to various roasted dishes. Saffron mojo, whose main ingredient is Canarian saffron, tastes excellent with all kinds of fried cheese. Garlic mojo is ideal to put on pizza. Herb mojo is made of mixed spices and is ideal for all kinds of salad. In Cuban cooking, mojo applies to any sauce that is made with garlic, olive oil or pork lard, and a citrus juice, traditionally bitter orange juice. It is commonly used to flavor the cassava tuber and is also used to marinate roast pork. Without oregano, the sauce is typically called 'mojito' and used for dipping plantain chips and fried cassava (yuca). To create the marinade for pork, the ingredients are bitter orange juice, garlic, oregano, cumin, and salt. ^ Steve Otto (24 October 2007). "Cuban Is Ours, Any Way You Try To Slice It". The Tampa Tribune. Archived from the original on 7 May 2009.